Good morning. I hope you are all having a productive week. We have had non-stop rain which has actually been wonderful. I so appreciate the green hills and the change in weather for us. It’s made me want to stay in and get things done around the house. Not sure I have accomplished a whole heck of a lot but I sure have made tons of lists! Back by popular demand is my series called, “Pay this, not that.” While you may notice a difference in quality when you choose not to go super high-end, sometimes it doesn’t matter at all. Nor would anyone know the difference. And more money left in the bank is always a good thing. I think every room could benefit from a leather (or faux leather) accent. There is a rich quality about it and a masculine vibe that often helps balance out the light pieces in a room. We just added a bench almost exactly like this to our master bedroom. you can not beat the price. I will be the first to admit that the designer version is truly beautiful. But if the price tag does not work with your budget, I think the alternative is a beautiful option. Here is the bench we recently added. I LOVE it. It’s been a wonderful addition. I actually wish I had known about the longer version as I might have gone with that. Our chandelier is from the first Pay This, Not That. Such a steal. Let’s be real for a moment. There is no question a $17 wallet will look or feel like the Louis Vuitton original. But, hello! That savings? Ummmm. Sign me up. A few friends have the Neverfull bag and have bought the look-alike wallet just to toss in there. I might even pick one of these up for myself. At $17 I am willing to give it a whirl. For reference, the less expensive version is about the size of an iPhone. I found a used version of the real thing here. Texture, texture, texture. I do believe that people often look the importance of mixing textures when designing a space. 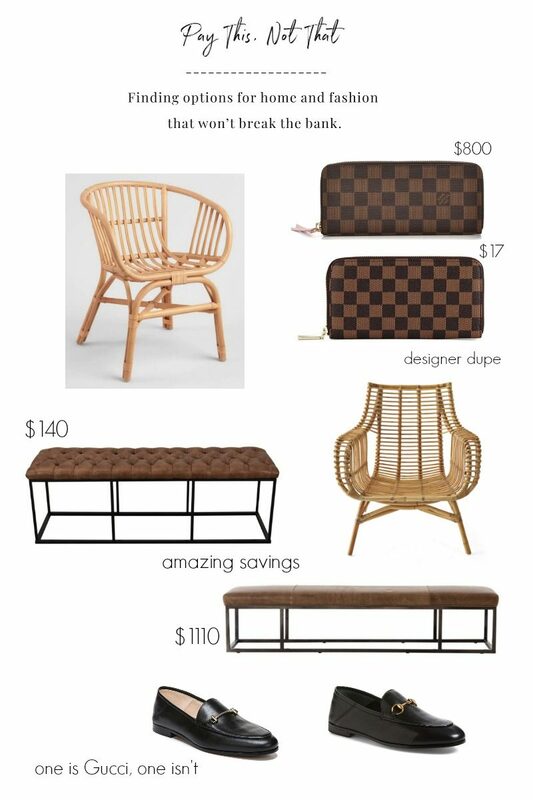 Rattan offers such warmth and interest to a room. 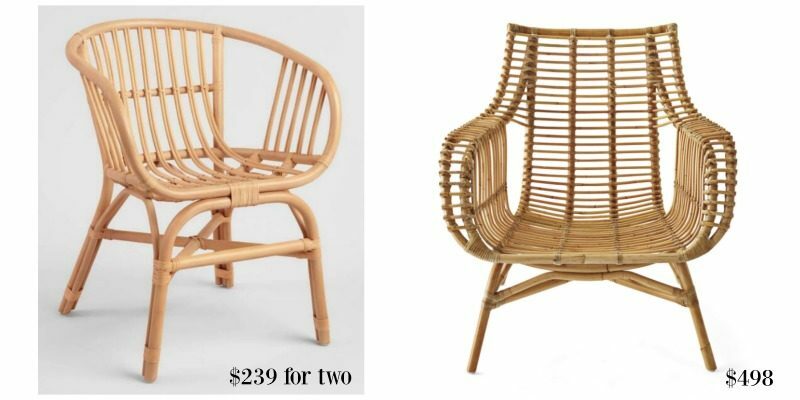 While you can spend close to $500 for the Serena & Lily version, you can add two to your room for just $239. The scale is a bit smaller but that may actually work in your favor if you space is not huge. 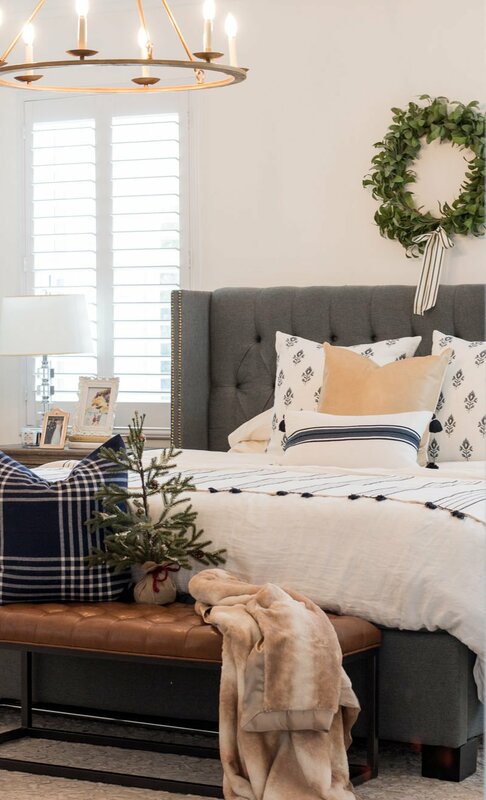 Add a pretty cushion or toss pillow and you’ve elevated your room just like that. I noticed the Target version is currently on sale for $118! That’s a great deal. Here is a great example of how much the texture of the rattan adds to this room. If you cover it up your hand, sure the room is pretty, but when you add that into the space it’s so much more interesting and rich. Let’s talk loafers! I adore a classic black loafer. They never ever go out of style and look beautiful with any Fall or Winter look. Honestly, a shoe like this can be in your closet for years always be on point. The Gucci version is well over what I would ever pay, but this version is just as pretty and receives wonderful reviews. I hope this was helpful. I’ll be working on my next installment so if you are trying to track down a better deal on an item, let me know. The plan is to hang our master bedroom drapery panels today. Wish me luck. I can’t wait to share an update with you all soon. Make it a great day. If you are local, stay warm and cozy. Getting caught up? 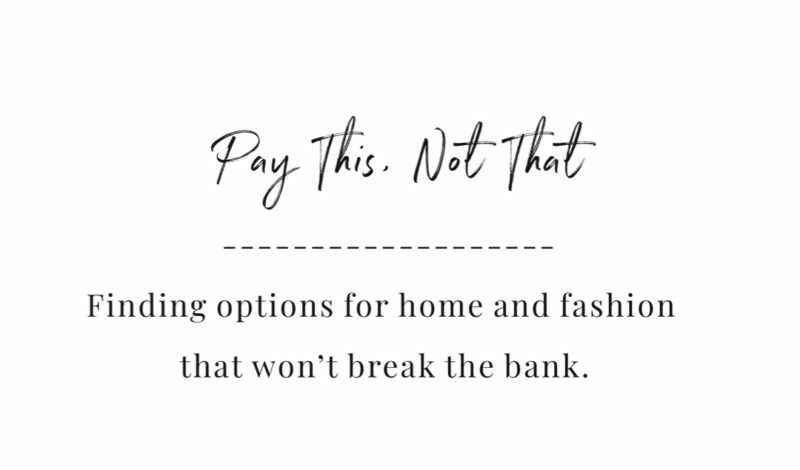 Check out the first Pay This, Not That. This is a very timely post for me. My husband and I are currently “in negotiation” about whether or not to place a bench at the end of our bed. So here’s the question…..when you make your bed, does your comforter sit on top of the bench? Or, does the comforter sit behind the bench? From the picture above, it looks like the former. What look to you prefer? I’m also wondering if a bench might help with stopping the comforter from slipping down the bed during the night. Would love your thoughts, and love your blog! Will you take a look at good quality white duvets and duvet covers. I’ve never bought one so I’ve been searching for information on them. It appears there is a lot to consider when buying one from weight to type of fabric to stitching to cost. From what I’ve looked at, they can be very pricey. We are getting ready to furnish a rental townhouse with 12 beds and I’m going to need to purchase bed linens for those 12 beds. A duvet with a duvet cover seems to be the most practical for washing the bed linens after every rental compared to laundering comforters and having them stay looking good. I’d love to see what you come up with. Thanks! This question piqued my interest. I found some very reasonably priced white duvet covers at Wayfair. I’m sure Courtney will be able to respond with additional sources. Have you considered Beddy’s, especially for any twin beds? As a renter I would love knowing that EVERYTHING on the bed was washed between every visit, and they wash so easily. I have one for my son’s bed and it’s a game changer when it comes to making the bed in the morning. Good luck! I’ve been very happy with my Threshold duvet from Target, of all places. And we have beach condos and our cleaning lady vastly prefers duvet covers to comforters for washing. I would also buy at least one extra in each size (as in if you have 6 kings and 6 queens, have at least one extra king and one extra queen) as cleaning turnarounds can be quick and gross stuff happens where a simple washing can’t take care of it. I was just going to seay while I think Duvets wash up well, I think a washable comforter would be my choice because it is so labor intensive to take off and put back on the duvet cover with every wash.